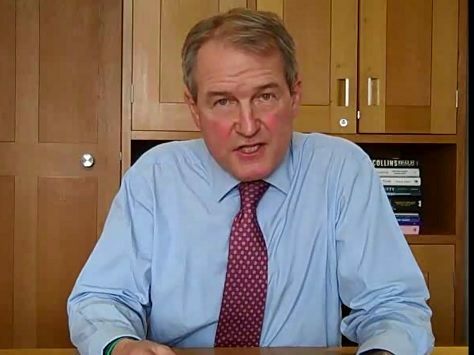 The “Green Blob” is condemning “billions to hunger, poverty and underdevelopment”, and is pursuing policies which would decimate the natural world and “devastate species and biodiversity”, former Environment Secretary Owen Paterson will claim today. Mr Paterson is due to speak at a conference on agricultural biotechnology in South Africa today. He plans to use his speech to attack the “green blob” – a network of “environmental pressure groups, renewable energy companies and some public officials who keep each other well supplied with lavish funds, scare stories and green tape,” the Times has reported. In particular, he aims to highlight their success in persuading the EU to ban the cultivation of GM crops. “They call themselves humanitarians and environmentalists but their policies would condemn billions to hunger, poverty and underdevelopment. And their insistence on mandating primitive, inefficient farming techniques would decimate the Earth’s remaining wild spaces, devastate species and biodiversity, and leave our natural ecology poorer as a result,” he will say. Worldwide the use of GM crops is on the increase. A record 181 hectares were planted last year across 28 countries, delivering benefits including a reduction in pesticide use, reduced greenhouse gasses, and increased yield. A report by agricultural consultancy group PG Economics published in May 2014 found that the global income gain through planting GM crops was €78.4 billion between 1996 and 2010, with poorer countries increasingly getting a larger slice of that income gain. By 2010, 55 percent of the extra revenue went to farmers in developing countries. It also found that global use of pesticides fell by 8.6 percent over the same time period, equivalent to nearly all the pesticide use in Europe for two years. Paterson intends to use his speech to criticise Dame Vivienne Westwood and other wealthy GM opponents for “fetishising their food” by trying to force their expensive taste for organic food on the poor. And he will accuse Greenpeace of supporting the “anti-GMO eco-terrorists” who destroyed ‘Golden Rice’, a strain of rice modified to carry beta-carotene, the precursor to Vitamin A. Golden Rice was first developed 15 years ago in the Philippines and is distributed for free to subsistence farmers. In 2005 a new strain, Golden Rice 2 was released, which contains up to 23 times more beta-carotene than the original version. In 2005, 190 million children and 19 million pregnant women, in 122 countries, were estimated to be affected by Vitamin A deficiency, which causes 2 million deaths a year. In 2013 an experimental crop of Golden Rice was uprooted by protestors from Masipag, a left wing alliance of farmers, scientists and development workers. No local farmers were involved in the destruction, as they believe it unlucky to destroy a living rice plant. Greenpeace has since said that it does not support Masipag financially. Nevertheless, Greenpeace continues to oppose Golden Rice and all other forms of GM crop. Mr Paterson will also accuse the World Health Organisation, the Food and Agriculture Organisation and Unicef of being “cowed by activist polemic” regarding Golden Rice.